Alice Paul and the Battle for the Ballot. If you have been TORMENTED about what book you should read about the women's suffrage campaign in America from the turn of the century to 1920, LOOK NO FURTHER. I watched it about 15 times before learning the lead in it is supposed to be Alice Paul. 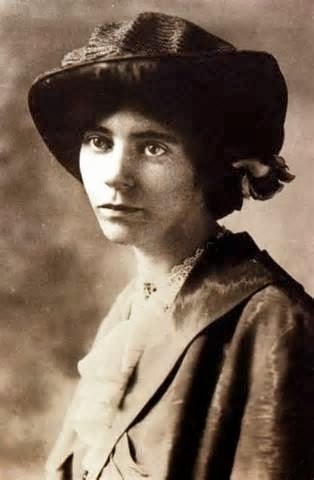 Alice Paul, whom the author says was as important to the suffrage movement as Martin Luther King, Jr was for civil rights. BOLD WORDS, MADAM. But her book bears them out. It moves quickly, and has the advantage of being written by a journalist rather than a historian. If you've read books by historians, I am so sorry. I love historians, but WE DON'T NEED THAT MUCH DETAIL. Mary Walton is excellent at picking out interesting pieces of information and putting them in a story that keeps moving. I enjoyed her writing to the point that I'll read whatever other books she's written (...I think her other is about the American workplace). Alice Paul was a Quaker from New Jersey. As a Quaker, she already believed in equality between the sexes, but it wasn't until she went to England and worked with Emmeline Pankhurst (of "take heart for Mrs. Pankhurst has been clapped in irons again" Mary Poppins fame) that she got politically involved in the suffrage movement. 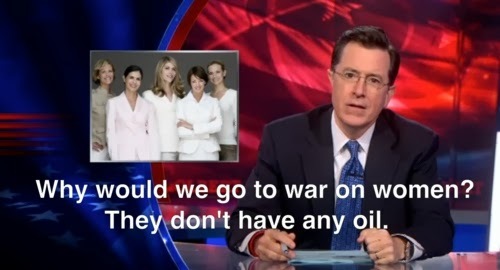 Because suffrage was being fought for in the UK and US AT THE SAME TIME. Only we in the US looked down on the suffragettes in England because they were doing hilarious things like pouring acid on golf courses and saying "NO GOLF UNTIL WE GET THE VOTE" and popping out from hidden corners in government sessions and yelling "VOTES FOR WOMEN" before they were dragged out by police. Alice Paul took right to these tactics, and she and her American friend Lucy Burns did things like scale scaffolding and come into buildings through the roof so they could interrupt legislators by popping out again and unfurling banners for their cause. She organized a MASSIVE parade in 1913, which is where the adorable Boy Scout thing happened. The National (headed by Carrie Chapman Catt, who was a total badass) didn't like how Alice and her group handled things, and still disagreed with the federal amendment idea, so Alice broke off and formed the National Woman's Party, which was basically NAWSA, but made up of mostly young women who wanted to take a more radical stand. And what did they do? Traveled the country. Campaigned against Democrats even though they were the party that had been helping them, because they weren't helping ENOUGH. Demonstrated some of the first nonviolent protests. PICKETED THE WHITE HOUSE. They were the first people to do this, thereby helping turn the White House from a residence to a political center. THEY CALLED THE PRESIDENT 'KAISER.' Damn, ladies. So yeah, a mob ripped that right up. The women refused to fight back, and then they brought out another banner. And the mob ripped that up too. And then the women were arrested for "obstructing traffic." The jail itself was cold and so filled with vile air that on arriving Alice Paul had hurled the sole book she brought for entertainment during her imprisonment, a volume of Robert Browning's poems, through a high closed window in a common room, breaking the glass and letting in some ventilation. Her unerring aim drew cheers from the other prisoners. They kept arresting them, then the women would refuse to eat, some would be force fed, and eventually they'd be released and go right back to picketing. Each time interest would die down, Alice Paul would engineer something else to get them publicity. Like burning Wilson's words in a public park. The National condemned their tactics, they lost members, but they kept going and refused to use gentler means of protest. They also had a giant card catalog system where they kept a dossier on every senator and representative, knew what they liked and didn't like, which clubs they belonged to, where they went to school, anything that could help them change their vote. This was later cited as a game-changer in the vote for suffrage. The amendment kept coming up and losing. But by 1919, it was losing by very slim margins. In rhetoric being used today, "Sen. Edward Gay of Louisiana...offered up the familiar argument, 'the right of the States to decide this matter for themselves.' The amendment lost by one vote." Not to go off, but have states' rights EVER BEEN USED FOR ANYTHING GOOD? They must have. Probably uncontroversial stuff. But with controversial things, I need to hear about one time they were the hero of the piece. Instead they're invoked for slavery, giving black people the vote, and against gun control, Civil Rights, and marriage equality. Stop invoking states' rights for terrible things. Stop iiiiiiiiit. As you might have learned (and is pantomimed in the vid above), the amendment finally went through, but had to be ratified by the states. It all came down to ONE GUY in the Tennessee legislature, a 24-year-old named Harry Burn who had previously voted against suffrage. But he had received a letter from his mother, the key line being "Hurrah and vote for Suffrage." And with the legislature in deadlock at 48-48, he voted for the amendment, and half the country was suddenly able to vote in the 1920 presidential election. What's that famous phrase? Those who do not learn from history are doomed to be total jackasses? Something like that. I think I'm inclined to be on the side of the National in most present day cases. Don't be too antagonistic, you'll lose respect, don't try to force the issue. 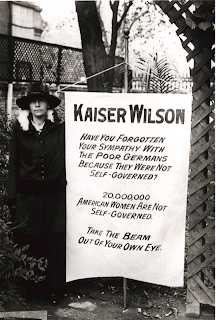 But Alice Paul and the National Woman's Party said TO HELL WITH THAT and they withstood freezing temperatures as they stood directly outside the President's home with banners telling the visiting Russian ambassador that President Wilson was "deceiving Russia." They refused to stop pushing until they got the amendment through. To be honest, I'm a little uncomfortable that that worked. Because that means being inflammatory and RELENTLESSLY irritating works. And I'm totally with Carrie Catt, over here sipping my tea and looking up from under my very large hat while a senator tells me why this is the worst possible time to be discussing the matter and let's discuss it again next term maybe. 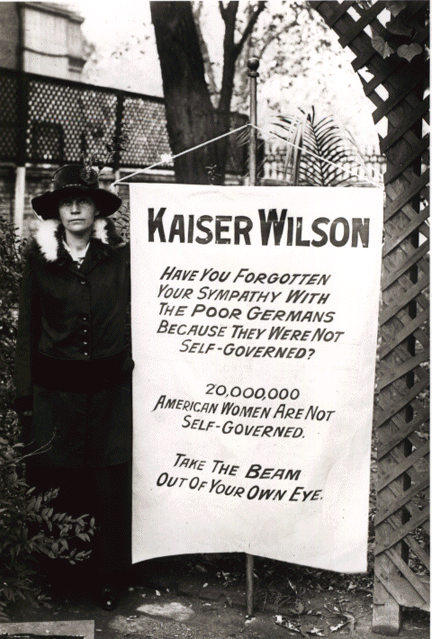 Alice Paul got us the vote in 1920. If you're going to know the name of one suffrage worker, know hers. States Rights is why women in some 22 states could vote in 1920 before the 19th Amendment was passed. Women first got the right to vote in Wyoming in 1869. This was swiftly followed by Utah Territory where Mormons gave women the right to vote and had the first woman vote in an election in 1870. The only reason this could happen was because voting was seen as a states rights issue and the federal government couldn't stop it. So there is something states rights was good for: Getting women the right to vote a half century before the 19th Amendment was passed.